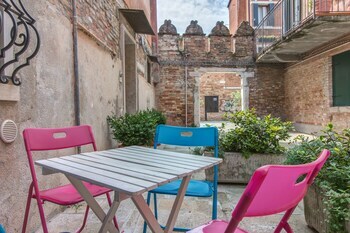 With a stay at this apartment in Venice (Dorsoduro), you'll be steps from Peggy Guggenheim Museum and 13 minutes by foot from St. Mark's Basilica. The front desk is staffed during limited hours. Located in Sannicola, this villa is in a rural location, within a 10-minute drive of Parco Acquatico Splash and Rivabella Beach. Free self parking is available onsite. When you a stay at Valtur Marilleva in Mezzana, you'll be near ski lifts, just steps from Sole Valley and Skirama Dolomiti Adamello Brenta. Free self parking is available onsite. Located in Calatafimi, Adamo is within a 15-minute drive of Segesta Archaeological Site and Greek Temple of Segesta. Featured amenities include luggage storage and laundry facilities. When you stay at Ostello California - Hostel in Milan, you'll be within a 10-minute drive of Corso Buenos Aires and Politecnico di Milano.